Hopwood-based artist Paula Hamilton visits a real gem of a craft centre. I had arranged to visit the studios of three very different artists at Canalside Craft Centre in Stoke Prior and thought a quick review of each one would combine to make an interesting verbal snapshot of the place. It was to Lynda Kettle’s studio that I went first. I have mentioned Lynda before because she was doing a painting demonstration at the Barnt Green Art Exhibition last year, where I was impressed by her ability to work in front of a bustling group of visitors and still be able to produce good art. At Canalside Craft Centre I found Lynda in her studio, which is a light, bright, airy space where she works on her canvases in oil, her favourite medium, and acrylic. 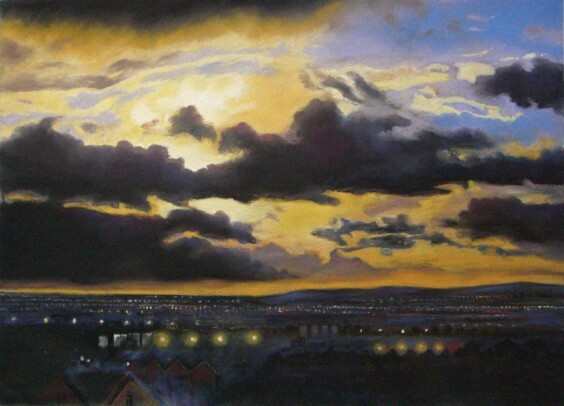 Lynda also paints beautifully in watercolours and some of her best work is in chalk pastel. Part of the reason Lynda handles so many different media with skill is that she has been in the art business all her working life. After completing a degree in theatre design, Lynda started her career working in theatres, designing sets, making props and getting involved in costume design too. Later she joined BBC TV as an arts director and production designer, working in London and then in Birmingham at Pebble Mill. She designed sets for arty programmes like Hartbeat and SmArt and several well known sit-coms such as Two Point Four Children as well as specials like A Song for Christmas. Since leaving the BBC, Lynda has become one of the few lucky artists I know who makes a living out of art – a rare thing indeed. She has developed a highly individualistic style through fusing her dramatic design skills with a clarity of detail and fascination with light and shade. Lynda is a member of the RBSA and Birmingham Watercolour Society as well as Birmingham Art Circle and West Midlands Pastel Society. She is a prolific artist, completing an average of one piece of work a week – no mean feat when she also runs two day workshops for beginners each month and travels to many different venues to exhibit her work. So it’s not just an illusion that this lady is everywhere – she really is – and so is her work. Currently Lynda is exhibiting her paintings with the Birmingham Watercolour Society, the Royal Birmingham Society of Arts and in the Mall Gallery, London. Not only is Lynda a very good painter, she also has an excellent business head (she is Vice Chairman of Women 4 Business). By making a series of high quality prints of her work, Lynda is able not just to sell the original piece but also prints of it, and she does this online, through her website. She is also a great networker and has contacts and friends all over the place who respect her work, encourage and promote her. Lynda is one of those people who has lots of energy and keeps coming up with ideas and new plans. I left her studio buzzing. I visited two other very interesting artists at the Canalside Craft Centre (http://www.canalside-craftcentre.co.uk), but that’ll have to keep for another time. I confess to being a bit of an art trail junkie – who can resist the opportunity to visit artists’ open studios, to see how and where they work? This year 77 artists and craftspeople are opening their studios to the public as well as galleries and other public spaces. The Worcestershire Arts Trail runs from June 1 – 4, 10am–5pm, a four-day intense blast of art and craft over the Jubilee Bank Holiday. There is a useful map on the website (http://www.worcsartstrail.org) pinpointing all the venues that can be visited. I’ve been planning my Art Trail wish list and hope to get to quite a few open studios. I’m quite partial to a bit of metalsmithing so I hope to get to see Claudia Petley & Paula Shepherd’s work near Bewdley. And Ineke Berlyn’s textile pieces, in Bromsgrove, look tactile, unusual and very colourful. Petr Horacek’s illustrations look really original and delightful but are over in Worcester so a way to travel. Then there are Richard Mansfield’s glorious pots over in Droitwich. And you could spend a whole day in Worcester, starting with the excellent Bevere Gallery and on to Frans Wesselman’s gorgeous illustrated stained glass work. So have fun over the Jubilee and, if you have time in between the street parties, go and enjoy some art and craft for free on the Worcestershire Art Trail – free, that is, unless you start buying the art!